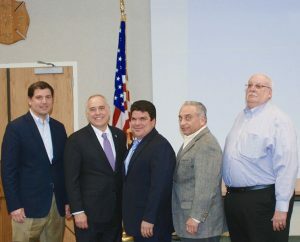 The Nassau Suffolk Water Commissioners’ Association , as part of its ongoing Educational Training Series, recently held a training session with New York State Comptroller Thomas P. DiNapoli. Mr. DiNapoli, a lifelong Long Islander and formerly NYS assemblyman from the 16th District, has served as New York State Comptroller since 2007. Mr. DiNapoli opened his presentation with a discussion of the mission of the NYS Comptroller’s Office, and outlined the steps to understanding the audit process. These ranged from initial research and information gathering to corrective action plans and field services surveys. Comptroller DiNapoli zeroed in on current situations including drinking water systems in New York State, and particularly on Long Island. He discussed the challenges all water districts face with aging infrastructure, stating “greater demand, increasing water loss, potential water system contamination and the need for increased security are serious problems facing us today. 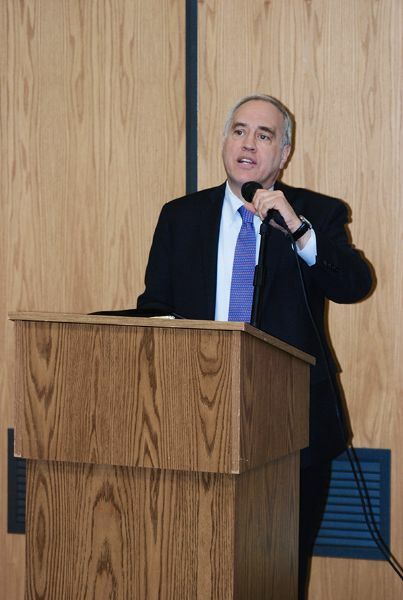 It is simply not enough to talk about environmental issues,” Mr. DiNapoli remarked, to much audience applause. “We need more long range planning, and we must take a more aggressive approach by making more dollars available to handle infrastructure needs.” He cited Governor Cuomo’s support of the Clean Water Infrastructure Act with funding for an Environmental Protection Fund to help support municipalities with modernized, sustainable water systems.